Welcome to Alpha & Omega! 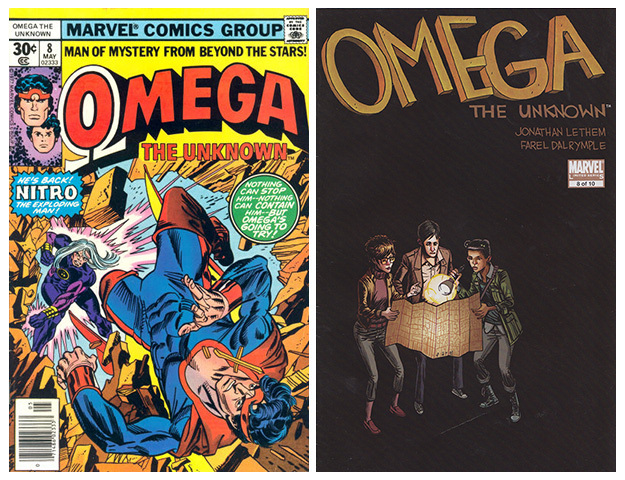 The blog series where we take a look at one issue each of the two Omega the Unknown comic book series—the original from 1976-77 and the re-imagining from 2007-08. I read these comics back to back always starting with the original version, but I don’t always write about them in that order. It depends on what I have to say about them. You may notice that a new tagline has been added across the top of the 1977 cover, “Man of Mystery from Beyond the Stars!” While not inaccurate, I find this tagline misleading about the tone of the book. The cover itself is pretty typical 1970s superhero fare and the callouts on the cover reinforce that. The reference to our hero as “Omega” does kinda annoys me. The 2008 cover of Omega the Unknown #8 is much better and something of a departure from the previous covers. It is not often you see a comic book cover that is mostly black and here Farel Dalrymple takes a chiaroscuro approach to showing Alex, Amandla and Fenton trying to make sense of a map of the Mink’s maze. It might be my favorite cover of the more recent series—at least so far—though the cover to issue #5 is a close runner-up. Omega the Unknown volume 2, #8 opens with The Mink confronting the thing that used to be Councilman Alfonso. He shoots the former friend and co-conspirator off the side of a building to its death using one of his many Mink-mobiles (this one a small armed hover-plane) and then spends some time signing autographs for onlookers. Throughout, he is his usual boorish self. His actions are observed by nearby robots including the 2U Quik deliveryman and the overgrown anthropomorphized hand that was once the Mink’s. This is weird stuff, but not as weird as the comic’s departure from its typical approach as it turns to address the cliffhanger that marked the end of the previous issue. “The Song of Silliman Renfrew” is the tale of the (apparently deceased) bearded and pudgy Omega that Alex, Amandla and Fenton found in The Mink’s Randall’s Island headquarters. It is told in verse by the Overthinker. Remember him? The living statue across the street from Edie’s place? As for Renfrew’s story, imagine a boy not unlike Titus Alexander Island or James-Michael Starling, who discovers his cosmic power and difference and is “ashamed of what exploded from his fingers” like other adolescent boys are ashamed of their nocturnal emissions. 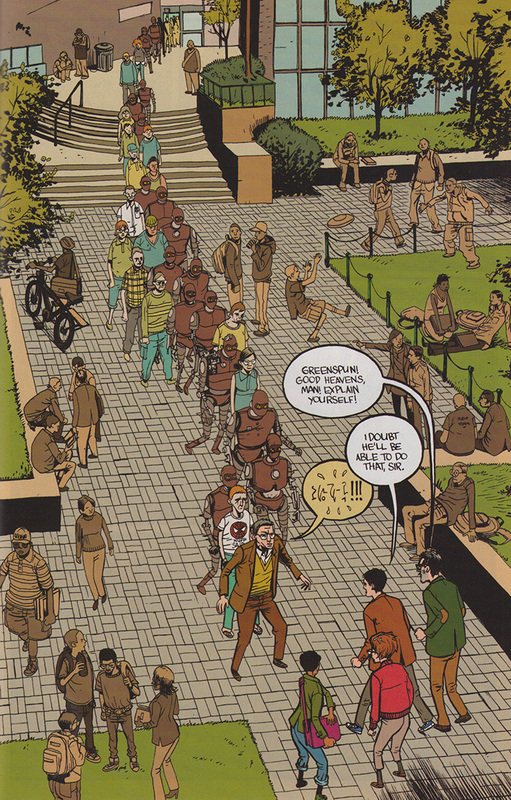 But unlike our boy protagonists, the circumstances of Renfrew’s discovering of his strange origins is not the result of a robot melting car crash but his parents’ worry that he was running with the wrong crowd. Essentially, he was a street corner burnout teenager. Discovering from his parents his expected role as savior of the Earth from the inevitable arrival of the all-subsuming robots, Renfrew rejects his destiny at first, preferring a dropout life. Leaving high school, he hitchhikes to Alaska with a friend, trying to escape the expectations of his parents and gets a job working on an oil pipeline. One day, however, overworked and hallucinating, his Omega instincts take over and he blasts an oil rig mistaking it for his robot nemeses. Returning to his parents, he decided to take up the Omega the Unknown costume but eschews any training. Soon he is homeless and then a street hustler and eventually ends up property of The Mink after he runs afoul of the police and blasts a few of them. True to form, the Mink makes himself out to be the only person able to handle the would-be superhero-turned-menace. It appears that a burnout like Renfrew is easy to confuse and manipulate. The Mink makes the best use of him he can as scapegoat and sidekick, as he is unable to figure out how to steal Renfrew’s powers for himself. These schemes eventually gets Renfrew killed in what is drawn to look like the infamous scene of the Chinese student facing down the line of tanks in Tiananmen Square. Honestly, I’m not sure what this reference is supposed to mean. At this point, the Overthinker drops the Grecian orator schtick, and I’m glad. In his own words, he has “mangled every meter,” and reading this summary of Renfrew’s life is painful because of Lethem’s chosen form. One of the best parts of his lesser known novel You Don’t Love Me Yet (2007) is his ability to write lyrics and evoke rock songs in prose, but he fails at this attempted form. I would have preferred another comic in the comic. 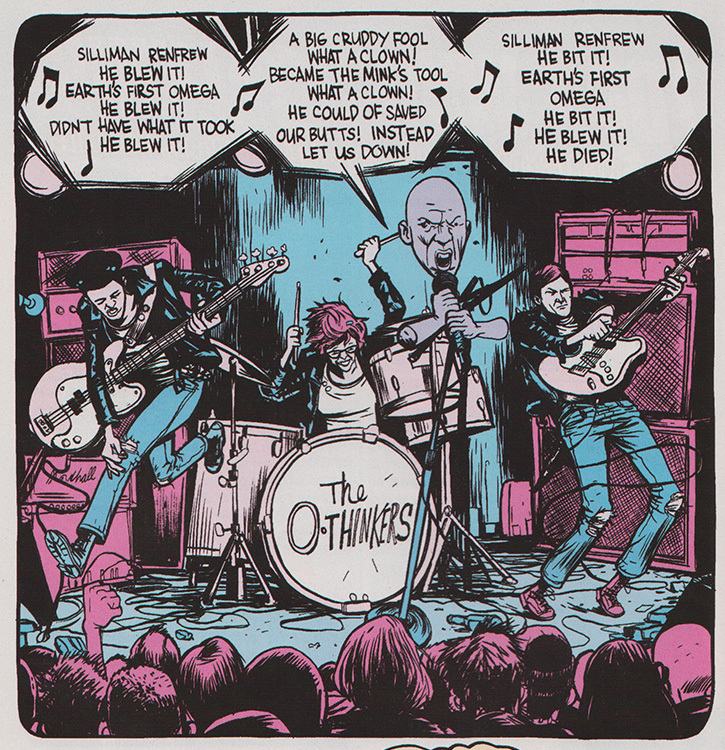 Instead, the Overthinker becomes lead singer in a band Farel Dalrymple renders with Amandla on the bass, Fenton on the drums, and Alex wailing on electric guitar—all three of them in black leather jackets. They rock out a recap of the tale and transition to those three characters who we find, after the page turn, wandering the Mink’s labyrinth in search of Omega. Oh! And for the first time in this series, the “blue guy” is directly referred to as Omega, though by our narrating Overthinker, not the characters involved in the story. Instead, Amandla (and then others) call him “fryer operator guy” (a reference to his short stint in issue #4 working in Reverend Upchurch’s food truck), which I find charming as heck. Nowhere Man look like a little Freddy Kruger. The maze occupant’s name and appearance may not seem so weird compared to some of the other stuff in this version of Omega the Unknown, but it seems like a very explicit reference to The Beatles’ Yellow Submarine cartoon film of 1968, and to me that is weird. While this Nowhere Man does not much look like the diminutive clown-like version from the film—except in size­—his ability to manipulate holes as a form of portal between worlds calls back to the film’s Sea of Holes, the place where the Beatles lose their Nowhere Man friend. This Nowhere Man allows Alex to enter the “Nowh-Area”—a place where you can “talk to a person you couldn’t otherwise. Someone dead…or imaginary”—through the lip of a jar. Alex hopes to be able to see his parents and get an explanation for what is going on, but instead he finds Hugh, the classmate who shot himself back in issue #4. Alex and Hugh have a long (and I think, mostly boring) conversation about their relationship to each other in relation to their marginalization in their school environment. Hugh hated Alex for actually being smart, while he was just socially awkward in his nerd-like appearance. He suggests, that despite the grief it got him, at least his glasses and demeanor allowed him to pretend to be smart. Once Alex arrived, someone who is actually hyperintelligent, such a performance was much more difficult to maintain. Hugh also admits that he simultaneously hoped that somehow Alex would protect him from bullies. In that moment Alex seems to accept his own destiny and obligation to help others, figuring something out about himself. 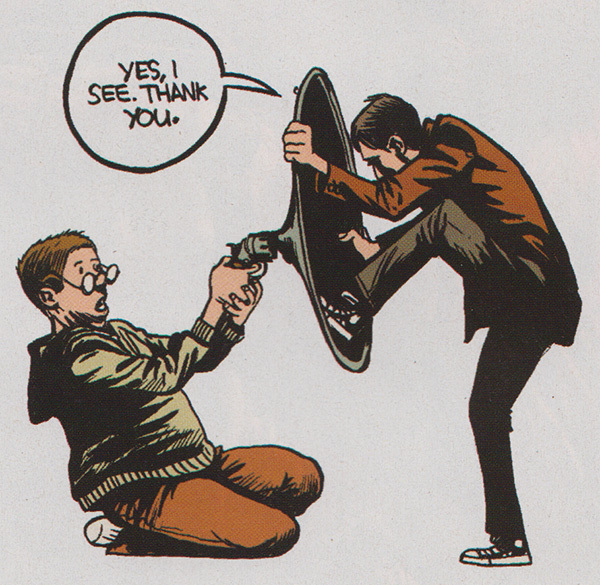 “But you’re just a kid…” Hugh says. “No, I’m not,” Alex replies. Hugh then pulls out the gun he used to kill himself and it looks like the dead kid is going punctuate this moment of clarity by shooting Alex—at least Dalrymple draws him with an expression that suggests malintent—but Alex is unperturbed and uses the hole at the end of the pistol barrel as a way to escape back to the real world, like he’s freakin’ Ringo. Alex uses the hole at the end of the barrel of the gun to return to The Mink’s maze. I guess here is where I admit that despite my deep love for The Beatles, I find “Nowhere Man” to be a tiresome song and its presence on Rubber Soul is why Revolver is the infinitely better album. The pathetically treacly “In My Life” and the unforgivably toxic “Run For Your Life” just makes my estimation of Rubber Soul even lower. It could be my feelings for this turn of events in the comic are colored by my measured view of the record, but probably not. It is the tonal shift and the blank white backgrounds of Dalrymple’s art. Anyway, back in the labyrinth, they find the mute Omega and escape with the help of the Nowhere Man before the Mink returns from dealing with Fonzie. They bring Fryer Operator Guy back to Upchurch and soon they are distributing the inoculating salt that Omega developed back in issue #4. Suddenly it makes sense why Alex was immune to the robotics textbook’s effect. He had eaten fries that were salted with Omega’s concoction from the food truck. Next stop after this realization is Columbia University, where with the help of Dean Quiller, Alex, Fenton, and Amandla face down Professor Greenspun and his army of infected students and their killer robots. Ultimately, Alex’s new willingness to accept his destiny—since talking with the ghost of Hugh in the Nowh-area—is what wins them the day. He uses his Omega blasts to blow up all the robots. Fenton and Amandla literally sit on the robotics professor and force feed him the salt until he returns to normal. Dalrymple even remembers to draw the lump of the robotics textbook under his sweater. When it is removed it is no longer the textbook at all, but the salt has transformed it into to something called “The Omega Chronicles.” Amandla quips, “Could make an interesting read, even if it’s no Rumblefish.” There are still other robot “franchises” to deal with and most of Greenspun’s robotics students escaped, but now they know how to deal with the infestation, with Dean Quiller promising to bring a sample of the salt to the Columbia Chemistry Department for them to reproduce its properties. The story ends with Amandla pulling out an Omega uniform from her bag. She had secreted it away from Alex’s parents house from their visit back in issue #5. “It is yours…” she says offering it to him. The actual end of the issue, however—sitting there across from those final panels—is yet another memorial page. This time for Jim Mooney who also died in 2008. Yet again, as when I came upon the one for Steve Gerber, coming upon this page really felt like a punch in the gut. I had no memory of seeing this before and, to be real, I never gave much thought to Jim Mooney or his work until I started this “Alpha & Omega” project. 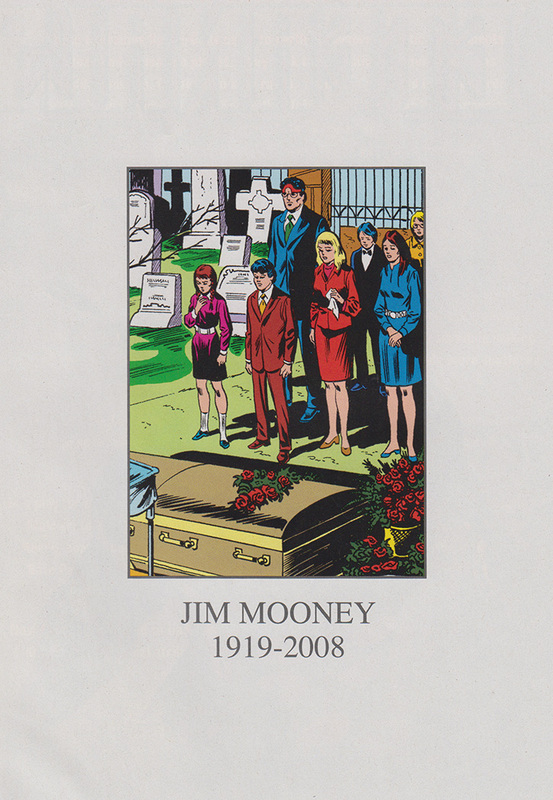 The memorial is a simple blown up panel on a white background presumably drawn by Mooney and probably from the next or final issue of the original series. The characters from Omega the Unknown—including Omega himself dressed in a suit but still wearing his Omega headband—are gathered at a funeral. Below it appears Mooney’s name and the years of his life. Simple and impactful and sad. It is strange to think that he was just about the same age as my grandmother who died that same year. Enjoying his work on this series so much and seeing how his art gives it so much of what it has going for it, this feels like a real loss, just not realized until a decade on. While I knew his name mostly as an inker of many issue of various Spider-Man comics, I am now curious about his other work, including his long run drawing the back-up “Supergirl” stories in the Action Comics issues of the 1950s. I never realized that the 1970s work for which I knew him was actually at the far end of a career that started in the comics boom of the 1940s. Unfortunately, this melancholy feeling is exacerbated for me by the fact that Mooney does not pencil Omega the Unknown volume 1, #8. Sure, he inks over Lee Elias’s pencils, embellishing them to the point where I think any resemblance the characters have to what we are used to are a result of Mooney’s efforts, but the art remains off. It is not that the art is bad. In any other book at any other time it would be more than serviceable, but the fact that it looks like Mooney was using inks to shape the art in such a way to remain consistent with his own style means the ink lines tend to be dark and thick. Everything has a shaded look. This is especially the case in a few fight scenes for some reason. The letters in this issue also reinforce a sense of sadness, since most of them are from readers who enjoy the series but are convinced that it has been or soon will be cancelled. Some think it is “too intellectual” to last and others are convinced that the lack of resolution to the mysteries of James-Michael’s robot parents and his connection to Omega will lead readers to stop coming back to the book. In both cases the editor responds that Omega the Unknown is not being cancelled, but from our spot 40 years on we know better, which makes the editorial protestations and promises to reveal what is going on in the coming months a bitter pill to swallow. The other thing going against the 1977 issue is that Steve Gerber and Mary Skrenes are once again not on writing duties. Instead, we have Roger Stern, a writer whose work in the 1980s— when he penned books like The Avengers and Amazing Spider-Man—I am very familiar with and loved as a kid. This, however, is one of his earliest pro credits at Marvel, and the story does not show much of a hint of the pathos and intense relationships that would drive his work in the 80s. As with Scott Edelman’s approach in the previous issue, it could be that the editorial mandate to not muck with Gerber and Skrenes’s plans too much may have limited what Stern could accomplish—especially in just one issue—but this is about as straightforward and just plain boring an encounter with a supervillain that Omega has so far had. Omega the Unknown’s scheme for containing Nitro is totally tubular! Even the featured villain himself, Nitro—coincidentally, one of the villains Kurt Busiek suggested in his letter in the previous issue—is one that has made so little of an impression on me that until I read this issue I didn’t know he wasn’t a character created in the 1990s when I wasn’t paying much attention to cape books. To be honest, the first time I can remember noticing him is due to his part precipitating the poorly-considered Marvel Civil War event of 2005. I mean, I knew he existed before then, but I considered him something of a recent joke of a character. 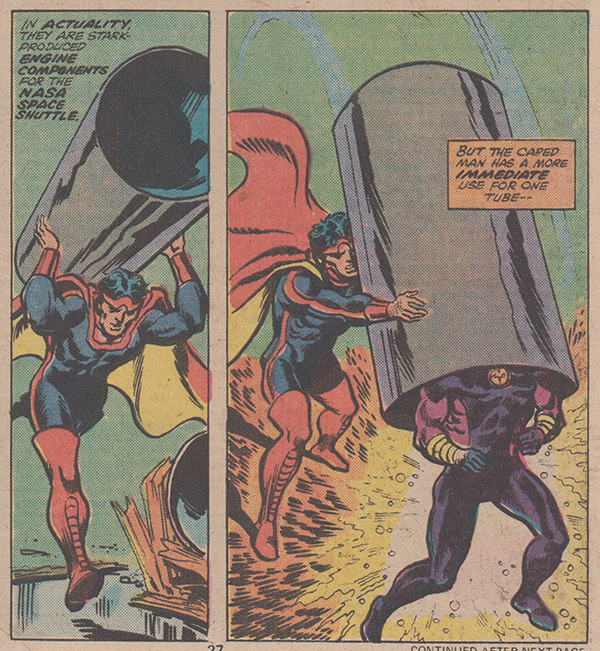 As it turns out, he’s been around since 1974 (created by Jim Starlin) and appears out of nowhere to fight Omega the Unknown in his quest for revenge against the original Captain Marvel (that is, the Kree warrior, Mar-Vell, not DC’s Shazam-shouting Big Red Cheese, or the 1980s Monica Rambeau Captain Marvel, coincidentally co-created by Roger Stern, nor the current Captain Marvel, Carol Danvers). He is confused by the blue and red costume, but once he realizes his mistake he tries to go on his way. 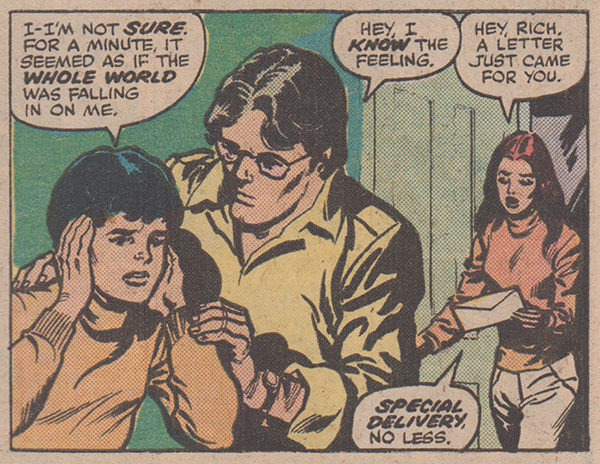 There isn’t much worth noting in the superheroic portion of the story in the 1977. Once again Omega speaks, having near a whole dang conversation with a police officer, but Gramps does not appear at all, just when his grief and loneliness were making the poor old guy an interesting character. Omega and Nitro fight a few times, but Nitro gets away. He then gets so mad that Omega keeps interrupting his schemes that he decides to forget about his hunt for Mar-Vell to focus on defeating this new foe. He is about to manifest the ultimate degree of his explosive power to bring a whole city block tumbling down on our hero when Omega manages to slide a metal tube over the villain at the last minute, containing most of the blast. The explosion is so violent that the shockwave collapses the roof of the warehouse they are fighting in. Nitro’s atoms are scattered, and he is defeated (though from what I understand about his powers he will eventually be able to reconstitute himself). At the moment that oblivion overtakes Omega the Unknown—presumably knocked unconscious by the collapsing warehouse—James-Michael Starling feels a startling flush “like the whole world was falling in on [him].” He is comforted by Richard Rory, who arrived earlier in the issue, and is trying hard to play an avuncular role for the adolescent boy. But wait a minute! Richard Rory? Who is that? Richard Rory comforts JMS as he once again feels his connection to Omega the Unknown. Rory is a fairly popular figure of what I’ve dubbed “The Gerberverse,” that is, the various stories and titles like Howard the Duck and the Defenders, through which Steve Gerber carved out a distinctive part of the Marvel Universe. 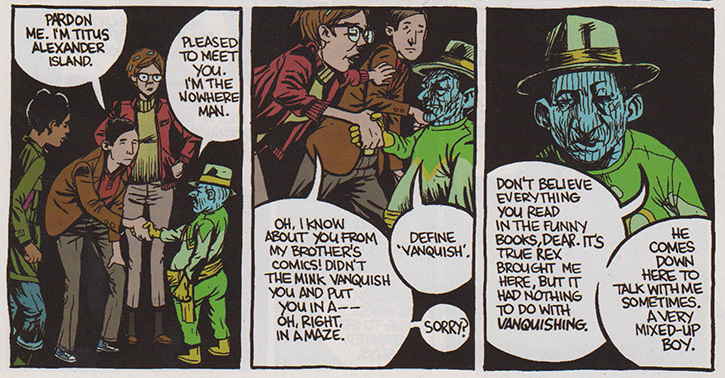 Some readers may be familiar with the character from his appearances in Man-Thing and his friendship with the eponymous monster. He’d later be a semi-regular in Sensational She-Hulk. Other readers may hone in on the similarity of the character’s name to “Richard Cory” of the eponymous late 19th century poem, or the version set to music and performed by Simon & Garfunkel. 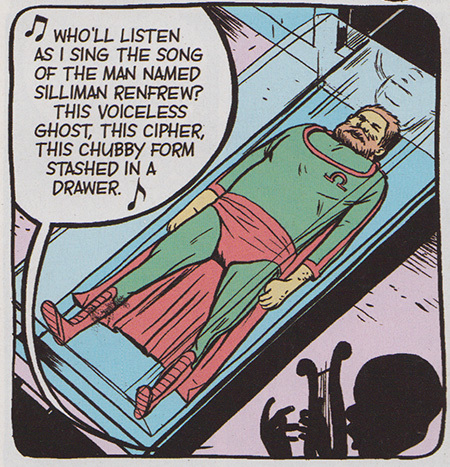 And while Gerber claimed he named the character as he did because “Richard Cory” came on the radio when he was first writing him, ultimately, the hippie-ish weirdo, who is also a little square, is about as far from the figure in the poem as you could imagine. Rory arrives after serving a jail sentence for events that happened in other Gerber-penned comic books, seeking to stay with his girlfriend Ruth. He is something of a jerk, though it is not clear if we are meant to think of him that way. But he makes disparaging comments about where Ruth and Amber live (when he is relying on their hospitality) and insists on calling James-Michael “Jim.” (Lord, do I hate people who take the liberty of shortening your name without being invited to). It seems he has brought some Citrusville Florida shenanigans with him to Hell’s Kitchen, because soon after his arrival he receives mail from someone called “Foolkiller,” threatening to kill him. I guess that makes sense, given that in my brief exposure to Richard Rory, “fool” seems like an appropriate description. One constant in Omega the Unknown volume one is the unsavory character of Hell’s Kitchen. There are only two issues left to go in both series, though the original Omega the Unknown series is then wrapped up in two issues of the Defenders which I’ll cover in an 11th installment of this series. Regardless, the end approaches, and with it comes the seeming inevitable disappointment that come with the vast majority of endings.